University President Drew G. Faust will sign an agreement Friday with the Pentagon that will recognize Naval ROTC. The move fulfills a promise she made at a speech (above) with Chairman of the Joint Chiefs of Staff Admiral Mike Mullen in attendance. 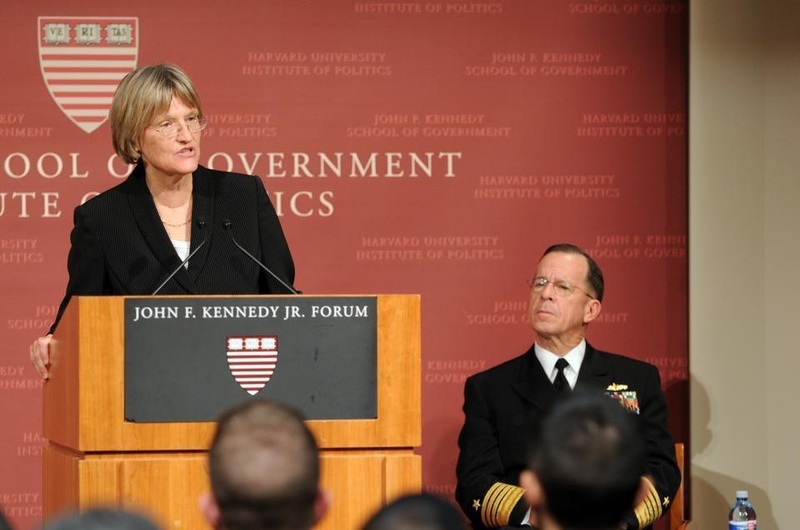 In her address she said that she would welcome back ROTC to Harvard with the repeal of "Don't Ask, Don't Tell." The Reserve Officers’ Training Corps will be formally recognized by Harvard Friday after an almost 40-year hiatus, the University announced Thursday. University President Drew G. Faust and Navy Secretary Ray E. Mabus are set to sign an agreement Friday that will recognize Naval ROTC on campus. Although ROTC will be officially recognized, a unit will not necessarily be established on campus, and Harvard cadets will continue to train at the Massachusetts Institute of Technology. Previously, University officials said that they would not recognize the program until “Don’t Ask, Don’t Tell”—the military policy which banned gays and lesbians from openly serving the military—was lifted. Since Congress repealed the ban in December, Faust and other officials have been in discussions with the Pentagon about bringing the program back to campus. According to the agreement’s terms, a director of Naval ROTC will be appointed at Harvard, and the University will provide some funding for the program. The University is also pursuing talks with the other services about resuming official relations, according to a press release. “We are going to get aggressive about reaching out to the other services,” said Kevin “Kit” Parker, chair of the newly created ROTC implementation committee. Parker is an associate Professor at the School of Engineering and Applied Sciences. Military budget concerns are the biggest barrier preventing the return of other services. Army ROTC programming around the country may contract in the future, said Parker, who served as an Army major for three tours in Afghanistan. In 1969, Harvard expelled ROTC amidst a wave of student and faculty anger over the Vietnam War. Later, the University justified its continued split with the military on the basis of “Don’t Ask, Don’t Tell,” which Harvard considered in violation of its non-discrimination policy. In recent years, relations with the military have warmed significantly. Since 2008, Faust has attended the spring ROTC commissioning ceremony, continuing a precedent set by her predecessor, Lawrence H. Summers. During a campus event with Joint Chiefs of Staff Chairman Michael G. Mullen in November, Faust made clear that ROTC would be welcomed back when the military changed its policy on gays and lesbians. But until Thursday, that recognition had not been made official. For the last several decades, cadets have had to overcome a number of obstacles in order to participate in ROTC. The recognition of the program will result in increased access and benefits for current cadets at Harvard, including use of facilities, according to Parker. “Students have had to struggle against adversity to serve the nation and also get a degree from Harvard, and I am so proud of them,” Parker said.